A few readers have asked me about my previous work hence here is a featured article from India's largest all sports website - Sportskeeda. This article was also selected as an Editor's pick. “Boss, I think I’ve found you a genius” were the only words Manchester United manager Sir Matt Busby read in a telegram, which was sent from Belfast to Manchester. The ‘genius’ in question was a 15 year old George Best and the words to describe his precocious talent were used by Bob Bishop, who was a talent scout for the football club. In 1961 George Best made the move across the sea to Manchester and he would go on to be a cornerstone of Sir Matt Busby’s historic European Cup winning side and a part of United’s much vaunted trio of attacking players – Sir Bobby Charlton, Dennis Law and George Best, popularly known as “The Holy Trinity”. 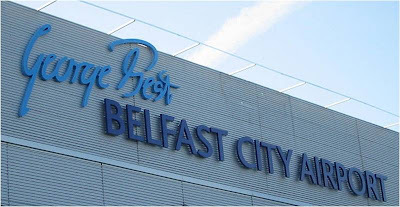 However, everything could have gone horribly wrong, as on moving to Manchester an increasingly homesick Best decided to return to Northern Ireland. Sir Matt had to use all his powers of persuasion (something us younger folks have seen Sir Alex Ferguson do time and time again) to convince young Best that playing for Manchester United lay in his best interests. Both George Best and Manchester United were to never look back. 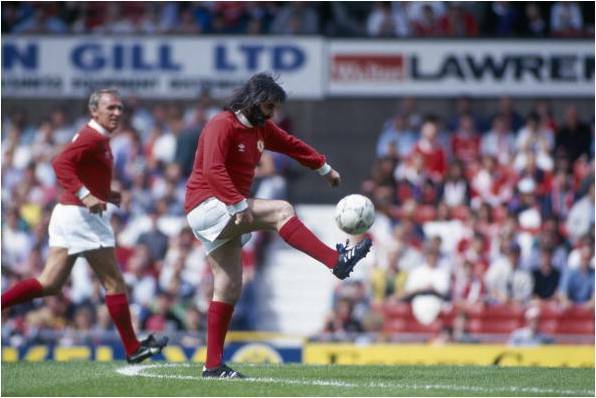 Manchester - 1991: George Best controls the ball during an Exhibition match held in 1991 at Old Trafford, Manchester, England. George Best turned out in Manchester United colours for the first time at the age of 17 against West Bromwich Albion on 14 September 1963. Manchester Evening News raved about the young Best in their match report and praised his “natural talent” and “style”. In 1966 Manchester United were carrying a 3-2 lead from the home leg of a European quarterfinal tie and had to play away against Benfica, who were led by their talismanic striker Eusebio and were themselves going through a golden age of their own, at one of Europe’s footballing citadels aptly called the “Stadium of Light”. George Best selected this moment and at the grandest of stages to announce his arrival to the whole of Europe. Sir Matt Busby had given his players clear instructions to play keep-ball, maintain possession and in the process quieten the crowd, a crowd which was known for its hostility and held no fear of expressing themselves by setting flares or bursting firecrackers. But George Best had other ideas and as Paddy Crerand, Best’s teammate and current MUTV presenter, puts it subtly “Besty just went daft”. Best opened the scoring with a header and added a second after having received a flick-on from a teammate. He ghosted past three defenders before calmly slotting it in the corner of the net. Manchester United went on to hand Benfica their first home defeat in 19 European matches with a scoreline that read 5-1. Sir Matt later remarked to George “You obviously weren’t listening”. George Best went into the match as a rising star and he came out of it as a superstar. The Portuguese media and every major European newspaper inspired from his performances on the pitch and mopish hairdo dubbed him as “El Beatle”. With the sixties in full swing George Best emerged as a cultural icon and was more like a pop-star with devoted fans coming together and establishing George Best fan clubs all over England even as far as Russia and Japan. He would receive over 1,000 fan mail letters a week. The ubiquitous George Best could be seen gracing magazine covers, opening boutiques and even participating in music shows like “Top of the Pops”. He was, as the popular saying goes “someone women wanted to be with and men wanted to be”. 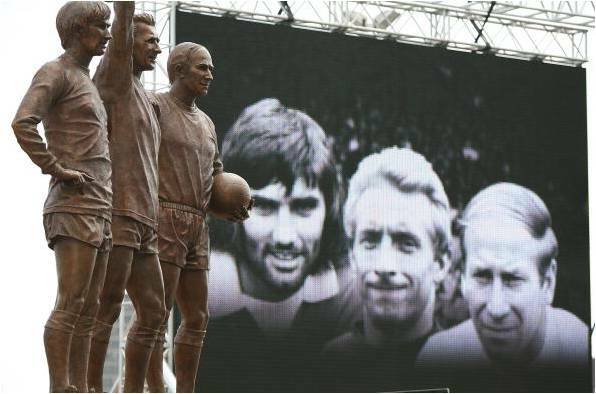 Manchester, United Kingdom - May 29: The statue of Manchester United's 'Holy Trinity' of players stands in front of Old Trafford after being unveiled on Maay 29, 2008, Manchester. George Best was at the absolute peak of his powers and was bestowed with both European Footballer of the year and Football Writer’s Association Player of the year. This was around the same time when Pele had remarked that “he was the greatest player on earth”. Best had racked up 28 goals in the league that season, an astonishing return for a winger, also a club record for most goals by a winger, which stood the test of time for many years at Manchester United until broken by Cristiano Ronaldo in the 2007-08 season. Along with players such as Denis Law, Sir Bobby Charlton, Paddy Crerand and Bill Foulkes, George Best formed the backbone of a Manchester United side, one of the most thrilling and entertaining club sides England and Europe had ever seen. Law, Best and Charlton were collectively known as “The Holy Trinity”, the most potent and gifted collection of attacking players to have played in England with each of them having won the European player of the year award. Best had once famously said “If I had been born ugly, you would never have heard of Pele”, a statement which goes to show the sheer belief and audacity of the man. As a child, he would work on his dribbling and shooting with a tennis ball at the touchline of a hockey field, where his mother played hockey. Later as a Manchester United player he would spend hours at the training ground perfecting his heading ability and developing his left foot. All of this would go on to make George Best the biggest showman in football Great Britain had ever seen. He had it all in his game – speed, balance, vision, superb close control, the ability to create chances and score from seemingly impossible situations. Paddy Crerand famously claimed that George Best gave defenders “twisted blood”, a phrase that Sir Alex would use to heap praise on another United prodigy Ryan Giggs many years later. The European title would unfortunately turn out to be his last major honour at Manchester United and his career. Since 1968, Best never quite managed to recapture the giddy heights he had already reached in his professional career but he always teased his fans and spectators alike with moments of pure undiluted genius. After leaving Manchester United in 1973, he turned out for clubs in South Africa, Scotland and the USA. His journeyman-like adventures included a two-year stint with Fulham, who were playing in the erstwhile second division back then. George Best being George Best was box-office as always, while playing at Fulham, he managed to attract record attendances, numbers that were unprecedented since post-war times. His post Manchester United sojourn also included a stint with the San Jose Earthquakes in the United States, where he scored a goal he rates as the best in his career. Unfortunately, the World Cup, considered as the biggest prize in world football was robbed off one of the world’s biggest talents. George Best whilst representing Northern Ireland was never able to participate at the World Cup and rightly takes his place among the tournament’s pantheon of legends, an honour his genius truly demanded. However, he did have his moments with the national team, as sports writer Bill Elliot recalls of the time in 1976 when a slightly declining George Best’s Northern Ireland took on Johan Cryuff’s swashbuckling total-football playing Netherlands at Rotterdam for a World cup qualifier. Bill went on to ask Best whether he found Cryuff to be a better player than him, and this was at a time when Cryuff was widely acknowledged as the best player in the world. Best laughed it off and boldly claimed that the first chance he got in the game he would nutmeg Cryuff. Best began the game on the left and Cryuff was playing on the other flank. Once Best received the ball instead of moving towards the goal he moved across to find Cryuff, the ball giving Best company at all times on his expedition to find Cryuff . During his course he went past some minor obstacles in the form of three dutch players with ease and finally confronted the ‘world’s best player’. Best dropped his shoulder twice and slipped the ball past Cryuff’s open legs and he turned around Cryuff and collected the ball. Best had a god-given talent and he could decide to turn on the magic as and when he pleased. George Best drew his last breath in 2005 after a long and unsuccessful fight against alcoholism. People all over the world and all ages paid their respect to a genius who gave so many people joy with a ball at his feet. Ex-players were effusive in their praise, Argentine legend Diego Maradona said of Best “George inspired me when I was young. He was flamboyant and exciting and able to inspire his team-mates.”I actually think we were very similar players – dribblers who were able to create moments of magic.”George Best was an artist extraordinaire and he left an indelible mark on legions of fans and admirers. Stories and highlight reels of him playing the beautiful game will continue to inspire generations of players to express themselves with a ball as he so effortlessly did.